Klára was born in 1986 in The Czech Republic. She studied 6 years at Conservatory in Brno prior to receiving her bachelor diploma in Prague at the Academy of Performing Arts. Klára came to Holland for first time as part of the The Erasmus Exchange Program for 5 months. After that she decided to return to do her master’s degree at Koninklijk Conservatoire in Den Haag. 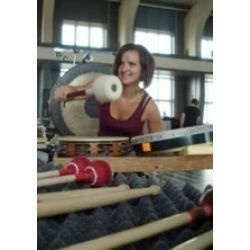 She graduated in Classic Percussion and now studies Sonology at the same school.